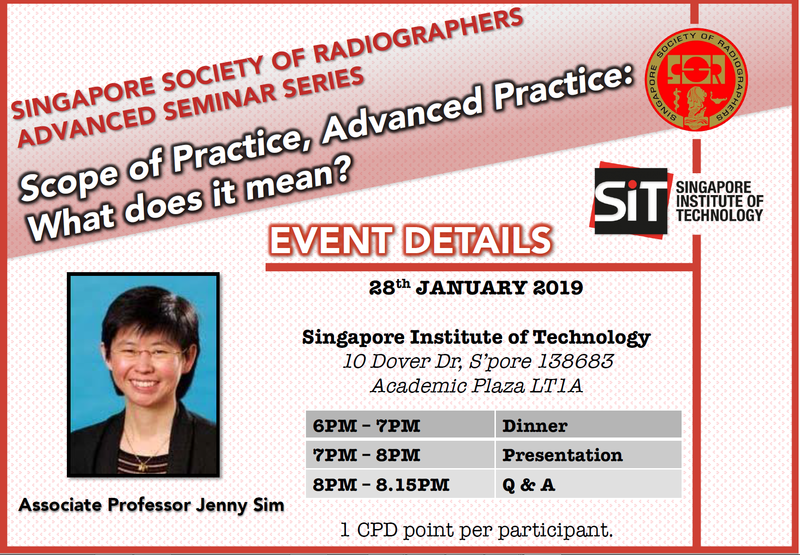 Singapore Society of Radiographers - SSR/SIT ADvANCE Seminar - Scope of practice, advanced practice: What does it mean? google-site-verification=6eg37azjhvwaxcy2doqbopjwffmjhez5xkz5jupnypg23zq3m7la.mx-verification.google.com. SSR/SIT ADvANCE Seminar - Scope of practice, advanced practice: What does it mean? Presenting the Singapore Society of Radiographers Advanced Seminar Series, jointly held with Singapore Institute of Technology! Come join us as Associate Professor Jenny Sim, Program Director Medical Imaging University of Auckland, examines the concepts of scope of practice and advanced practice. It explores various permutations of scope of practice across different countries revealing a lack of consistency in the definition of what constitutes a scope of practice. Using the United Kingdom and Australia as examples, we will also examine how advanced practice is defined in these countries. Questions will be asked of the importance of societal context and the role of stakeholders in shaping these concepts. Associate Professor Jenny Sim provides academic leadership, sets strategic directions and actively engages industry stakeholders to achieve quality education outcomes. She enjoys pushing professional boundaries, in particular, designing innovative curricula that enhance student learning and assist student transition from university to workplace. Jenny’s research has a strong applied focus, with her research contributing to the scholarship of learning and teaching at both postgraduate and undergraduate education in Medical Radiations. And subsequently, shuttle buses will be available at SIT@Dover to Buona Vista MRT station at 8:20pm.